As part of the circulatory system, arteries carry blood from the heart to the tissue organs, and veins carry blood back from the organs to the heart. The blood in the veins travels against gravity with the help of valves that push the blood up. When these valves get weaker and do not function properly, the blood leaks backwards leading to the accumulation of blood in the veins. In turn, the veins enlarge and become swollen resulting in varicose veins. Among the factors that could lead to varicose veins are family history, older age, pregnancy, overweight and lack of movement. Varicose veins can be treated by implementing lifestyle changes and through medical procedures. Treatment of varicose veins will relieve the symptoms, prevent any complications, and improve the appearance of the legs drastically. 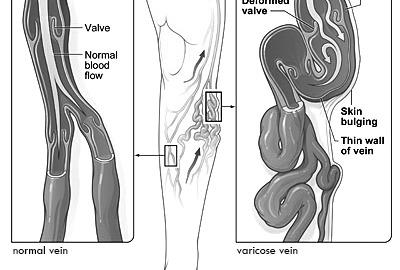 What Causes Varicose Veins? Overall rating:	5	out of 5 based on 17	reviews.